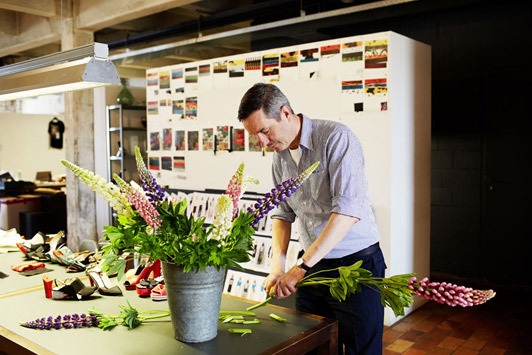 There’s a new book out by the Photographer Todd Selby – Fashionable Selby – opening the door to the sort of voyeurism that really tickles my fancy: Designers at work..
Dries Van Noten quietly arranging beautiful flowers. A highly organised bohemian Isabel Marant. A Marant mood board with a lust-worthy bracelet. Olivier Rousteing, Creative Director of Balmain at work on a stunning parquet floor. Inspiration from every corner: Carla Sozzani, Italian gallerist and founder of Galleria Carla Sozzani and the creator of 10 Corso Como in Milan. 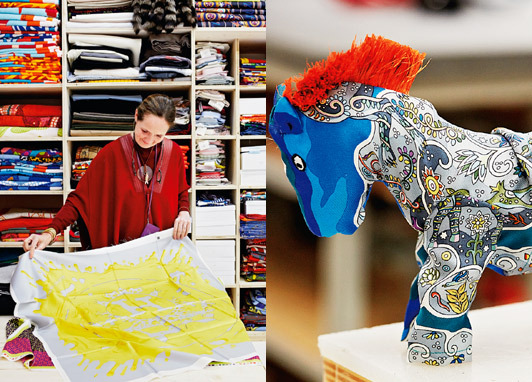 Surrounded by colour: Pascale Mussard, Artistic Director of Hermes Petit H.
It’s thinking you have that little bit of knowledge to know what they’re really like and what makes them tick..the reality behind the curtain. Even though you know in your mind, you’re still seeing what they want you to see….but it helps that each profile is accompanied by Selby’s watercolour portraits and illustrated questionnaires, revealing answers to personal questions. It sounds good, love to see those creators in their element, make us to know them a little bit more. I just read a review about the new book and added it to my Amazon list!! This is easily going to be one of my new favorite art books~! Such beautiful images. And I would quite like Isabel Marant to come over and organise my wardrobe (actually, make that my entire apartment) please!